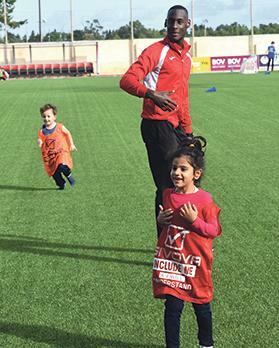 A community inclusion programme recently launched nationwide by the Malta Football Association means that a number of migrant children, teens and (in some cases) even adults get to join their Maltese counterparts on the pitch. Mqabba FC coach Michael Degiorgio shouts out some instructions, and the whole group moves towards the centre of the ground as one. Some parents look on, quietly sipping a coffee or chattering among them. So far, so mundane, you might say. Only, it’s not, because the Mqabba football club is one of a number of local clubs that opted to be part of a community inclusion programme that was recently launched nationwide by the Malta Football Association (MFA) – which means that a number of migrant children, teens and (in some cases) even adults get to join their Maltese counterparts on the pitch. The ratio, today, is a nice mix between Maltese teenagers and some 20 Syrian migrants who come from nearby BirŻebbuġa. Of course, in an ideal world, this sort of inclusion would be par for the course. But, for now, full inclusion and diversity is still a goal that the majority of the Maltese population is still working towards – and this programme promises to be one of a number of such initiatives that are already making a difference. Peter Busuttil is the project coordinator and responsible for Football Social Responsibility at the MFA. He is the driving force behind the project, which is titled Include Me and I will Understand; he tells me it was launched last year and is being co-funded by the MFA and the EU, with some additional funding last year coming through the Uefa Football and Refugees Grant. The project funding has been renewed through 2019. The project, he adds, helps both Maltese and migrants, as the MFA is working hand in hand with local agencies like Leap and Appoġġ to attract the participation of Maltese. To date, Include Me and I Will Understand has attracted some 300 participants. “The aim is not simply that of engaging migrants and Maltese who are in a vulnerable situation in social activities and sports, but also to include them within the community. The priority is to enable an environment where they can train and play football together. As part of the project, we also offer language lessons,” he says. A nationwide call was issued to football clubs, and a healthy number showed interest in participating. “Football is a very social activity, because it’s not just about the game. So many people are involved, from coaches to referees, to parents, teachers, volunteers...” Mr Busuttil says. Training typically brings with it a host of other social events, from picnics to that most famed of all Maltese activities – just hanging out together, having a natter. “We are very pleased with the way the programme is working because inclusion is taking place organically. It is heart-warming,” Mr Busuttil continues. Mr Degiorgio echoes these words. The club currently counts 20 to 25 migrants who are taking part in the programme, with ages ranging between seven and 17. “Each one of them trains with their relevant age group and there is a very encouraging air of positivity on the pitch and around. Most are from Syria, and our languages are surprisingly similar, so communication has not been a problem. I was very pleased to see them being welcomed by our crowd, and inclusion seems to have happened very naturally,” Mr Degiorgio says. The youngsters themselves have shown an encouraging eagerness to be part of the whole social scene at the club, with not even the most adverse of weather conditions stopping them from showing up for the weekly sessions. “You can tell that they are genuinely into it. We had a couple of bad storms, and they didn’t use it as an excuse to skive off training. As it turns out, the weather was too bad to be out on the pitch anyway, but we still chilled at the club and had fun,” he says. Now, Mr Degiorgio is working to get the under 15s and under 17s registered so that they will be able to take part in competitive leagues, together with their peers. The programme makes it possible for participants to truly become 100 per cent part of the scene, thanks to a holistic approach that also provides ancillary needs like a full training kit and, when needed, transport to and from the clubs. San Ġwann coach Christopher Sant attests to the efficacy of this holistic approach. His club currently includes about 11 migrant children aged between five and seven. “We don’t just play football. We organise regular events, some of them with a cultural or heritage angle, such as outings to the valley, viewing the cart ruts and so forth,” he tells me. The programme has been welcomed by NGOs, with ADITUS director Neil Falzon pointing out the importance of initiatives that remind us of “our shared humanity”.